Couscous Circe: As Circe, but the captured piece reappears on the Circe rebirth square of the capturing unit. Pawns reappearing on promotion squares are promoted instantly, at the choice of their own side. Amazing problem! Neat use of Coucous Circe condition. Six promotions including AUW. 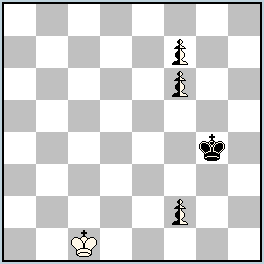 Can anything better be done in two moves ? Many thanks for the flattering dedication of this problem, another example of the remarkable possibilities of T&M in combination with neutral pawns and rebirth conditions, of which Couscous is probably the most interesting. Not just an AUW this time but an extra Q in each case, and all in the space of two moves! Perhaps a slight shame, though, that a nS is idle in one mate.